I used to have a pair of turquoise blue, grey and black masked lovebirds, called Bibby and Bobby. They sat together all day long, preening each other, and were never separated for very long, even when they were in my community aviary. 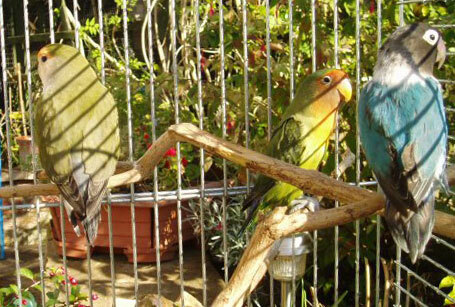 However, circumstances changed, and my aviary birds were all sold and the aviary dismantled, but I kept the two masked lovebirds in a fairly large cage, outside under the pergola. They weren’t bothered about flying around, so didn’t mind being contained in a cage. However, I still provided them with a breeding box in the hope that they would actually mate. They had several attempts, but the eggs never hatched out. After several years, unfortunately one of the lovebirds died, and I was given another green peach-faced lovebird by a friend, who had lost his partner too and was lonely, I named him Bobby too, like his predecessor. After an initial wariness between the two birds, they soon became firm friends and cuddled up together in the nesting box most of the time. Being different breeds of lovebirds, I was quite surprised to find that they actually produced eggs. I wondered if the eggs would in fact hatch, and if so what their progeny would look like. Some four weeks later, one chick emerged, all spiky and ugly, as baby birds are. The remainder of the eggs did not hatch, which was probably a good thing, as the nesting box wasn’t very big. Baby was another peach-faced lovebird, a different colour from her dad, but with a definite hint of masked lovebird around the eyes. So now I had Bibby, Bobby, and Babby! The parents were very good. Mum rarely left the nest, and dad sat on a perch outside feeding mum, who in turn fed their offspring. Soon Babby was ready to take her maiden flight. But she was a stroppy bird and commandeered the nesting box for ever more after that, so mum and dad had to sit outside, until I bought a second nesting box for them. Life for the little family continued in harmony for a few years. Bibby and Bobby still sat together, preening each other lovingly, while Babby used to perform all sorts of acrobats and somersaults around the cage. She didn’t appear to be lonely. One hot summer’s day, I had hung a birdbath full of water on the door of the cage, as I had done many times before. I’m not sure how it happened, but I heard a crash and a squawk. I dashed outside, to see two of the lovebirds flying into the trees in my garden, where they sat shrieking away. Luckily Babby had flown under the enclosed pergola, and I quickly managed to catch her with my bird net and pop her back into the cage. The bird bath lay on the floor where it had landed when it had fallen off. Now how was I to catch mum and dad lovebirds, who were sitting in the ash trees down the end of my garden, shrieking away to Babby in the cage, who was of course shrieking back? I fortunately had another small cage, which I placed in front of the original cage on the stand under the pergola, with food inside and the door open, in the hope that mum and dad would return to baby, and food. And dad did. Next morning, there he was just sitting in the little cage chirping away to encourage his wife back. I popped him back in the bigger cage, and left open the door to the smaller one in front. Would the trick work twice? Bibby made several attempts, but never actually went inside the cage with the door invitingly open. She seemed to be more interested in getting into the larger cage where her husband and baby were. I tried to catch her, to no avail. I decided to leave things alone and wait until she got hungry. Sooner or later she would find her way to the food in the little cage, wouldn’t she? Wrong. Bibby seemingly preferred her new found freedom. For a couple of hours she flew around the garden and then perched in the eucalyptus tree nearby, where she stayed. She must have been exhausted by now; she was not used to flying far. By this time it was lunchtime. I was sitting eating my salad, when I heard an awful squawk, more like a scream. I dashed out to see a sparrow hawk flying away from the eucalyptus tree with something in his clutches. I was sure it was my lovebird; my Bibby. I was in bits. What an end to the life of my little bird. I had owned her for so long; she was like one of the family. I kept crying every time I thought about it, and I thought that was the last I would see of her. Imagine my surprise to wake up one morning some two weeks later to hear shrieking in the garden from my lovebirds. I went down to investigate, only to find Bibby sitting on the cage and trying to find her way in to Bobby and Babby. I can’t remember how I did it, but I managed to catch Bibby in my bird net before she had a chance to fly off, and quickly popped her back into her home. What a relief. Tears of joy from me, and a big, big lovebird welcome from Bobby. I’ve no idea how she survived. How did she escape the clutches of the sparrow hawk? How did she find food? She must have managed to feed herself somehow in all that time. Perhaps she was eating birdseed that people had put out for wild birds. Suffice it to say, I never hung the birdbath on the cage doorway again, but put a little bath on the floor of the cage instead. But the love story of these lovebirds didn’t end there. A year or so later, I went out to feed the birds, only to find Bibby lying on the floor gasping for breath. She was very old by this time, and dying. Poor Bobby was down on the floor with her, trying to cover his wife over with his wings to keep her warm, as she lay dying. He’d also pulled over her some newspaper from the floor of the cage. So sad. Such a shame for him to lose the partner he loved so much, but at least he’d got Babby to keep him company after she died. Bobby and Babby became friends, and Babby finally let him share her nesting box. Not wanting to encourage interbreeding, I took away any eggs that were produced. Inevitably the end came for Bobby too last year, and I reluctantly gave Babby to a friend who has a community aviary, where she lives to this day.